Thrillers that take place onboard airplanes will always take a special place in my heart. Hollywood has been using the general fear of flying for efficient, effective thrillers for years. Some are dumb but memorable like “Turbulence,” some are simply outstanding action films “Air Force One,” and some are overhyped cult classics “Snakes on a Plane.” Some are even Oscar-nominated “Airport.” Heck and then there’s the best airplane movie ever made, the appropriately titled “Airplane!” The new Liam Neesen thriller (cue the groans) it set aboard a non-stop flight over the Atlantic in which a passenger threatens to kill fellow passengers until a large sum of money is deposited into a bank account. This is both a flawed and excellent premise for a movie: it’s flawed because as the plot is slowly revealed it just never makes much rational sense and yet it’s excellent because there’s nothing more exciting than a claustrophobic airplane murder mystery. 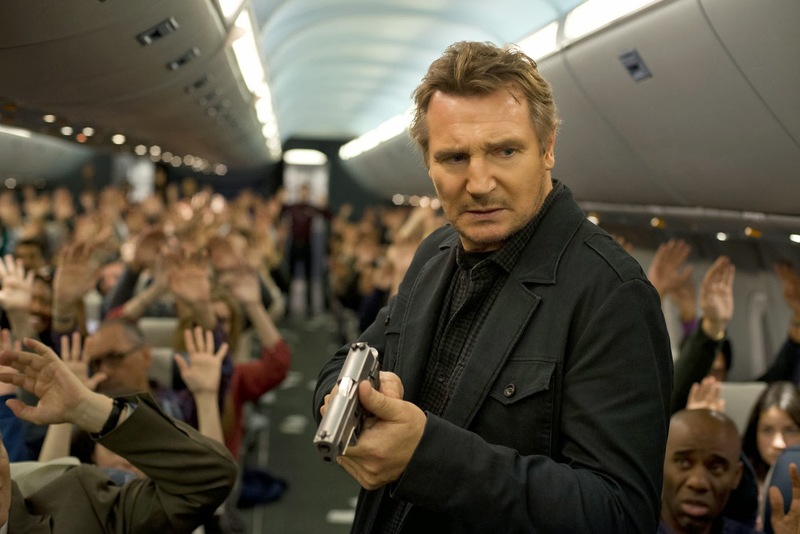 The initial, and inevitable, criticism was bound to happen: “Isn’t it just ‘Taken’ on an airplane?” I myself have never quite understood the popularity of the “Taken” series or of Liam Neeson (Oscar nominee for “Schindler’s List”) as an action hero. So frankly, the film could have starred anyone and I would have happily forked over my money. It’s all about the premise. I’m a sucker for pretty much any airplane thriller. The film works because it’s a premise that doesn’t actually seem like it would make much sense. I mean how hard should it be to stop a guy from murdering people on an airplane? When the film’s plot begins to unravel you get a sense of what the antagonist is really after however. The setup is good if not particularly spectacular or very original. Set in the post-9/11 world, Neesen is federal air marshal Bill Marks assigned to a transatlantic flight from New York to London. He’s sort of a mess. He’s an alcoholic and he has some issues having to do with his young daughter. He’s seated next to a female passenger named Jen (Julianne Moore) who engages him in conversation when she sees that he’s not the most comfortable flyer. Soon Bill begins received texts from someone claiming to be on the plane. This person is going to murder a passenger in twenty minutes if $150 million isn’t deposited into a specific bank account. Bill is hesitant to jump to extreme conclusions, but can’t just ignore it. Perhaps it’s all a sick joke perpetrated by the flight’s other air marshal Jack (Anson Mount). Conspiracy theories fly left and right as Bill becomes more and more obsessed with finding the culprit while making everyone onboard feel frightened, anxious, and confused. After all the screenwriters John W. Richardson, Christopher Roach, and Ryan Engle have found the screenwriter’s number one character trope for a thriller like this: is all this really happening or is it in the mind of the crazy protagonist? And what’s with all the other suspicious passengers. Moore’s character seems awfully too nice (and surprisingly cast) to not be more than just a typical lady who likes to sit in window seats on planes. You kind of have to turn your brain off to really enjoy “Non-Stop,” (although it’s actually not the most absurd of all the airline thrillers out there, though the final reveal is pretty out there) which is probably why the film left me guessing right up until the third act. It’s a pretty decent mystery actually. And the film certainly doesn’t just play things safe; if, for instance, a bomb were to be introduced, how lame would it be if the thing didn’t go off? And as crazy things get director Jaume Collet-Serra (who knows his way around twisted thrillers with “Orphan” and “Unknown”) feels fully in control and knows exactly what audiences want to see. Hence, there were several moments in which the audience actually broke out into applause as if we were watching some kind of over-the-top thrilling stage play.